A few years ago my PTSD raised its ugly head, a hidden scar from years of working as a paramedic that plunged me into darkness. The long process of healing, of becoming whole again, taught me a lot about mindfulness and purpose. It led me to re-define my entire life, for the better. In a strange way PTSD ended up being one of the best things that ever happened to me because I, like many others before me, built a new life out of adversity. This trip to Paris, which came on the heels of teaching a sold out workshop in Amsterdam, was a celebration of this new life in a way. There is a saying you hear every now and then that goes something like “build a life that you don’t need to take a vacation from”. That, right there, is exactly what I have done over the past few years. On this trip I walked the streets of Paris for 96 hours, a camera in my hands, creating art. Art that I will write about. Art that will be sold as prints. Art that I will share on stage during my presentations. Art that I will use to support my workshops and the books I have in development. Not art made on a vacation, but art made as part of the creative life that I built and choose to live. I hope you like the final set of images from this series. I have really enjoyed processing them, and I am very thankful for all of the kind words and comments that they have received. Sharing art is a wonderful thing, isn’t it? I like the 6th photo and second from last the most. The light and movement in the 6th (reminiscent of Trent Park), and how the woman breaks up the lines in the one before last. I’m glad to hear about how your life has changed because of PTSD. Photography is helping me learn to live, how to face going outside and it’s improving my ability to connect with people. Thankyou for sharing. Photography is wonderful, isn’t it? Being able to create art is truly a gift. Thanks Ian. Bests to you also. Beautiful photos Ian! I especially liked “Bistrot St. Andre”. Did you use ACROS simulation for this series? Yes, all of the images in this series are Acros. It’s great, isn’t it? Thank you for sharing! I love Paris, I love Paris in b&w and your pictures are just the way I see Paris! My pleasure! I too love Paris and can’t wait to teach there in 2018. Good stuff Ian. On the photo inside the dome, did you have any debates on color vs. BW? 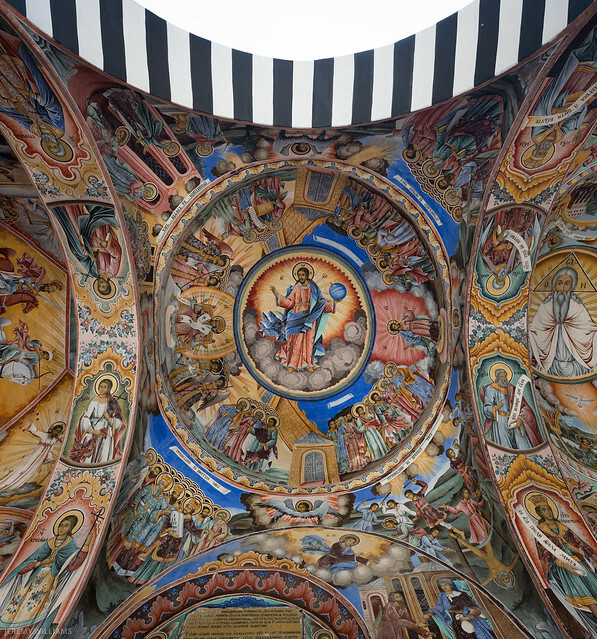 I’ve taken shots at the Rila Monastery in Bulgaria and the colors were so much part of the history that BW felt flat. Thoughts? That is an excellent question and for me it depends on the usage of the image. I also have the dome image processed in colour, but this series was all black and white and adding one colour image into the mix would break that continuity. If I was showing the image independently I would be fine showing it in colour or black and white depending on my purpose. Hi Ian. Tired, but good. I didn’t mean for that picture to show up there, just a link for comparison. And can’t figure out how to delete it. Is there a way? Thanks for the above reply and thoughts. The last picture with the striped skirt and striped tablecloth is my current favorite. As a general rule I don’t get into legal discussions on this site. In regard to your second question, however, I can say that most of my street images are taken within 10-20′ of my subjects. A lot of it is confidence, but there are definitely techniques which can be used to increase your keeper ratio. They are hard to write about in the comment section of a page but if you have a chance to take a workshop with someone you respect you will learn a lot about it I am sure.